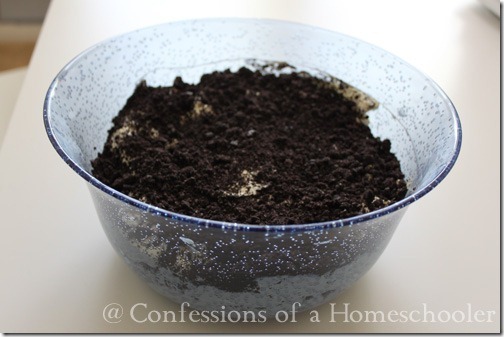 Okay, I realize this isn’t anything new, but I just wanted to post the recipe for Dirt Cake anyway! It’s so easy and fun, and the kiddos love it! Best of all it only takes about 10 minutes to whip together, great for a last minute dessert! Finely chop cookies in food processor, or put in Ziploc bag and bang around with a rolling pin until well crumbled! Mix butter, cream cheese, and sugar in bowl and set aside. In large bowl mix milk, pudding, and whipped topping together. Add cream cheese mixture to pudding mixture, combine well. Layer ingredients in flower pot or large bowl starting with cookies, then cream mixture. Repeat layers ending with cookie mixture so cake looks like it’s covered in dirt. Optional: add gummy worms or artificial flower and trowel and serve! This sounds like something my kids would love!